You'd be mistaken for thinking the C 600 Sport and C 650 GT were BMW's first foray into scooters. Not so, the R10 came some 60 years before them. 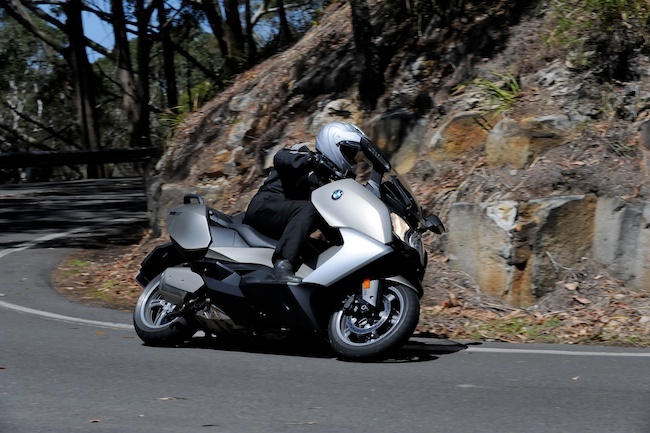 BMW Motorrad have ushered in a new and exciting era in Urban Mobility with the arrival in Australia of the C 600 Sport and C 650 GT Maxi Scooters. Both the C 600 Sport, with its narrow profile, sharp edges and active riding position, and the G 650 GT, with increased weather protection, comfort seat and electrically adjustable ‘screen, deliver a unique riding experience. These two innovative machines have the comfort and versatility of a scooter and the dynamic performance of a motorcycle. This is the first time BMW Motorrad has entered the Maxi Scooter market but not the first time a BMW scooter has been on the road. That honour belongs to the R 10 just on sixty years ago. In the early 1950's Europe was awakening from the horrors of WWII. There was a need for basic transport, and the motorcycle was perfect in that regard. 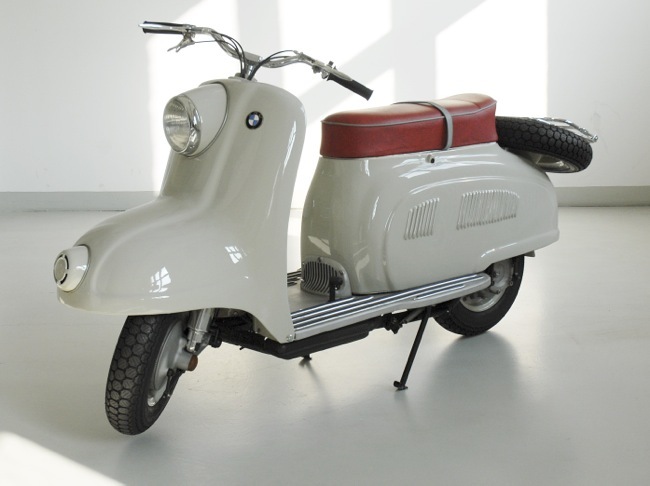 In 1948 BMW was back in business with the single-cylinder R 24 but, in Italy, Vespa and Lambretta had created the scooter phenomenon; practical with more than a touch of style. BMW followed this development with great interest and set about producing a scooter. 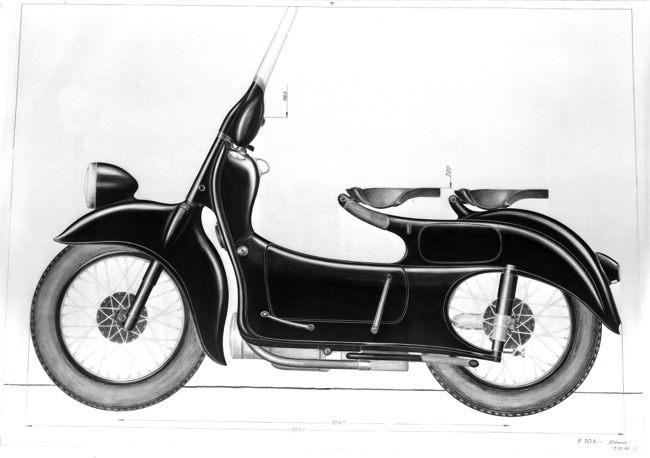 In the initial drawings, the designers came up with a hybrid; 16-inch wheels and step-through body powered by a 200 cc single-cylinder, side-valve motor. 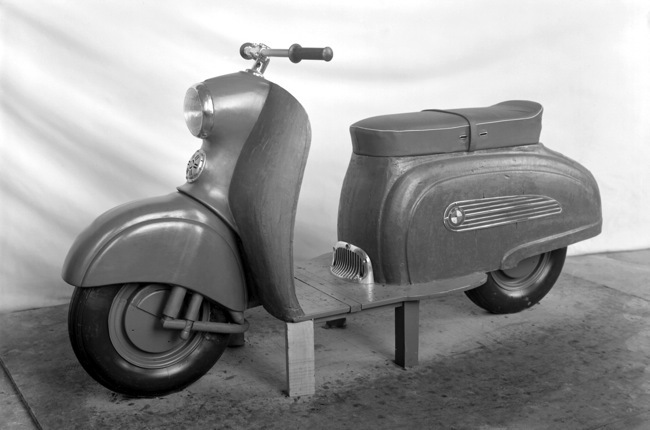 A mock-up was produced but it was decided to head down a more conventional scooter path to compete with the Italians head on. In early 1954 the final design was brought to life. Powered by the M210/1 single-cylinder 175 cc motor, the R 10, with its protruding headlight and prominent horn on the front ‘guard, was ready for production. This stylish and well-engineered scooter, with under seat storage and the spare wheel mounted at the rear, performed well; there was a lot of excitement from the development team. The R 10 was just about perfect and would create a whole new market for BMW. The BMW board, having been kept up to date with the R 10 project development, was impressed with the final product but held off on setting it into full-scale production. At that time BMW was not on a completely sound footing. The war had taken its toll, and in fact, it had only survived the peace because the occupying Americans needed to have their vast motor transport fleet kept on the road. BMW required a volume seller as the sales figures for motorcycles and scooters had begun to decline. BMW had also just acquired the rights to a small two-seater bubble car from Iso in Italy. There were only enough funds for one model and the board decided on what would become the iconic Isetta as their choice. The Isetta went on to be a top seller and in fact saved BMW at that time. The R 10 was pushed into the background and was, until relatively recently, largely forgotten. Now fully restored and in the BMW Classic collection, the R 10, which is fully operational, has been seen in the BMW Museum in Munich and at classic events. The C 600 Sport and C 650 GT will create a whole new market for BMW Motorrad in the same way that the R 10 was originally intended to do nearly sixty years ago. 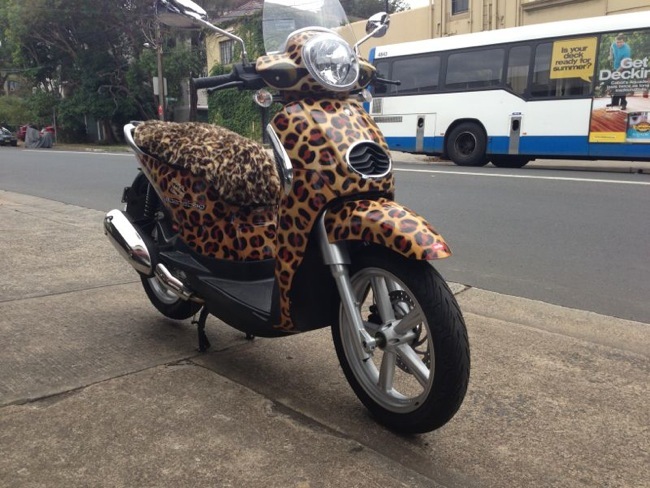 Sydney's Scooter Central opens for the post Xmas sales period. 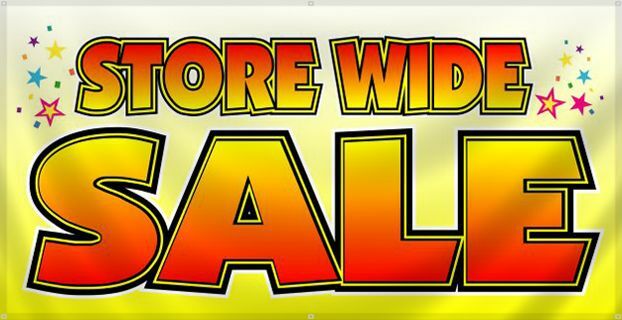 A massive 20% off all shelf stock across the entire store is just a start. We have dozens of new scooters and demo scooters that have been slashed in price. This is our annual "Massive Post Christmas Scooter Mega Blowout Sale". To make it all accessible during your Christmas break, we will be open Monday to Saturday, 8:30am to 5:30pm. Closed on the public holidays. Come in and save a minimum of 20% on helmets, jackets, gloves, topboxes, genuine Vespa accessories like windscreens, floormats, mirrors, levers, scooter covers, battery tenders, t shirts, caps, and so much more. Some of these items have been reduced even further, so come on in and browse our extensive range and save plenty in the process. 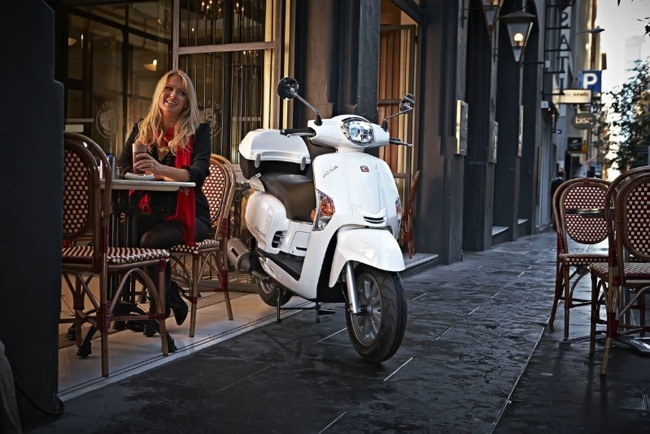 Vespa LXS 150ie demo in white, only 45kms on the clock, save $500 of the new price at $6190 ride away. 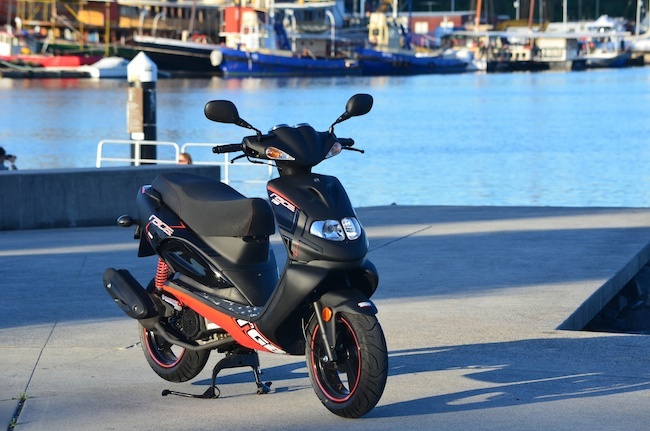 Kymco Ego 250 in red, was $5490, now $1000 off at only $4490 ride away with 2 years warranty and 12 months rego. 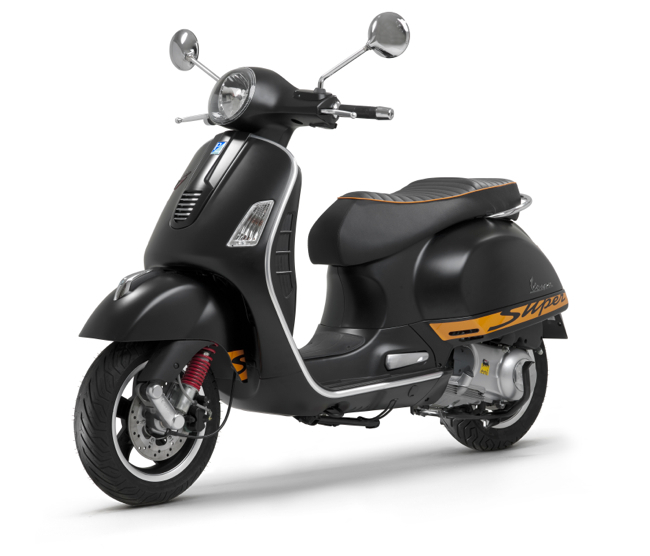 Vespa PX 150, brand new in red or black.....save $500 only $6490 ride away with 2 year factory warranty and 12 months rego. 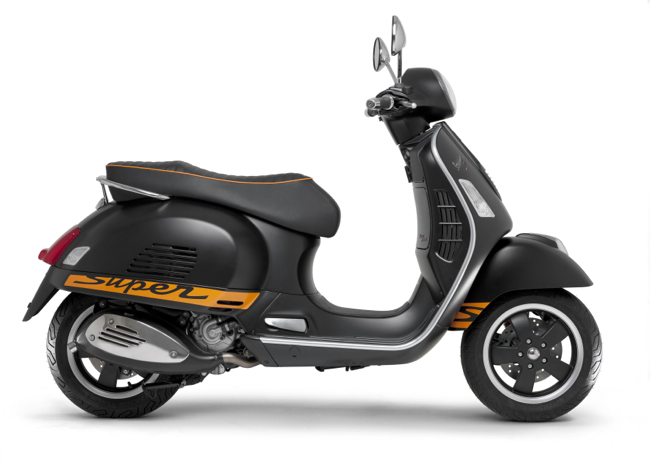 Aprilia Sportcity 300ie Cube in black or white, were $7590 now only $6990 ride away, no more to pay. 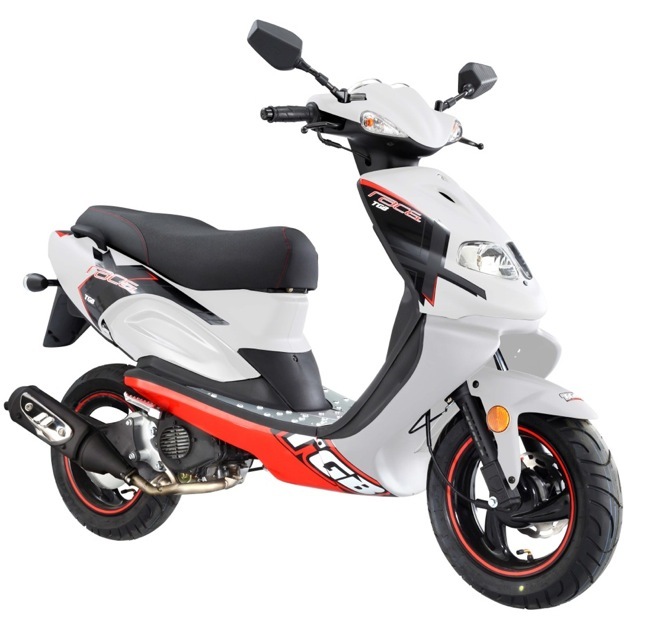 Kymco Like 125 in white, 2011 slashed from $3690 ride away to $2990 ride away. 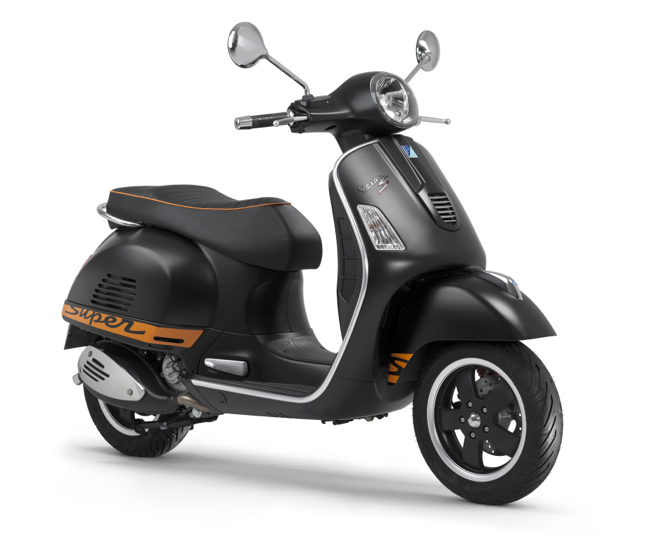 Piaggio MP3 500ie in black was $11990, one only $11490 ride away. 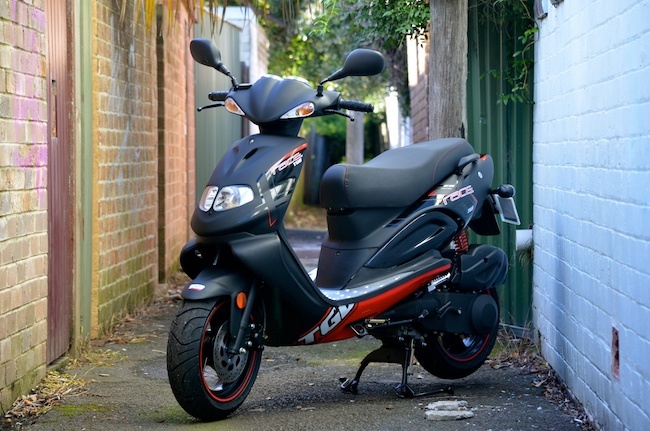 Piaggio Liberty black DEMO was $4390, this one with only 30kms on the clock only $3890. Second hand MP3 400ie in black with a genuine Piaggio topbox and rack kit was $7990, now only $5990. 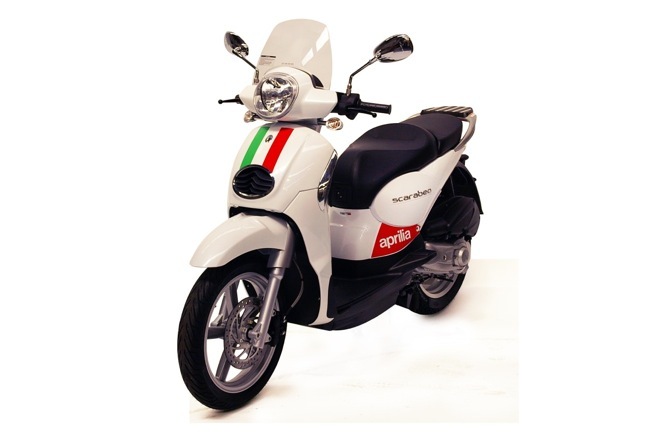 Demo Piaggio Fly 150ie in red, 12 months rego, 2 year warranty 60kms on the clock and down to $3490 ride away. Add the extra value of 20% off storewide on your accessories and you've got yourself a great deal. See plenty more instore. 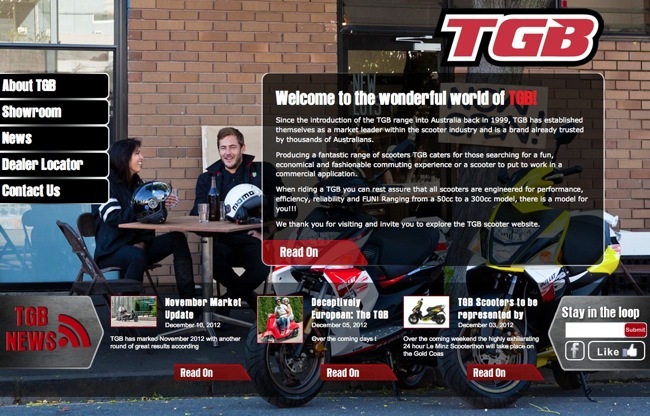 A new home on the web for TGB Australia. 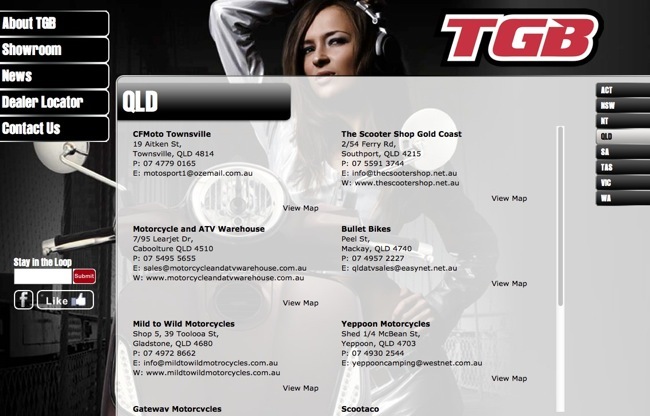 TGB importer, Mojo Motorcycles, have launched an all-new website representing the brand in Australia. The site will allow customers to keep abreast of the latest news, find a local dealer and view an up to date Australian model info. For each TGB model you can view the latest features, compare specifications, scroll through galleries and download brochures. 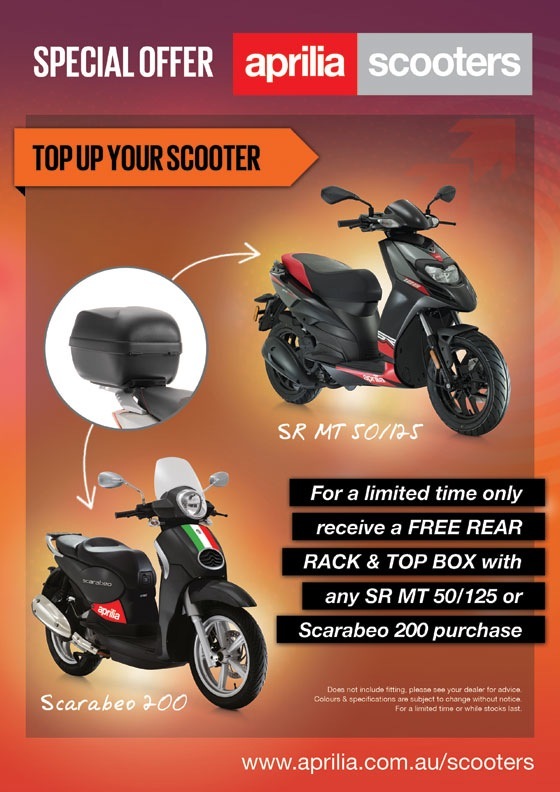 Aprilia offers a free 30 litre box on Sacarbeo 200 and new SR MT 50/125. Finding a two-wheel parking spot just got easier with the release of the new Motorcycle and Scooter Parking App for Android. 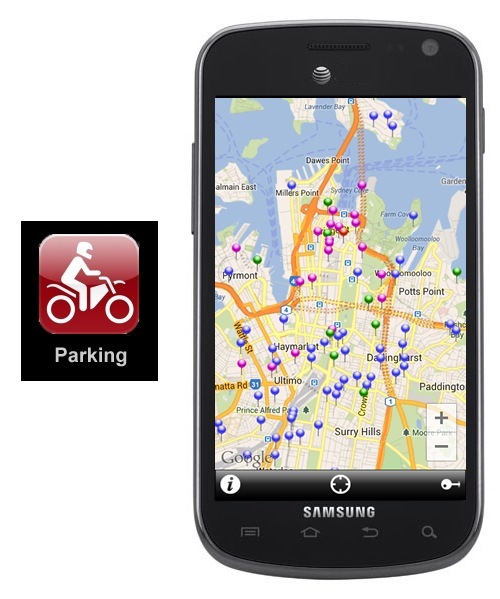 The Motorcycle Network uses Google Maps to mark parking spaces on their website www.mcnetwork.com.au and now with the release of the new Android app, motorcyclists can find bays and stations across Australia quickly and easily while out and about, simply by looking up their location on their mobile. iPhone users have been utilising the app for more than a year now and with over 13,000 downloads the feedback has been extraordinary. 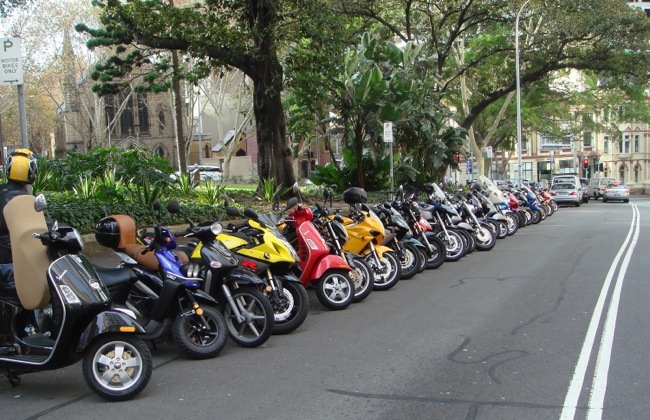 The two-wheel community has been contributing new spots to increase the count to over 1000 bays Australia wide. Accurate information on timed bays or Clearway restrictions has been programmed in. Zoom can be set right down street level or wider to get an overall picture of city areas. There is also a built in report function, so that any new spots, or changes to existing bays, can be quickly and easily reported by the riders out on the road. Precise GPS locations can be sent with just a few clicks. 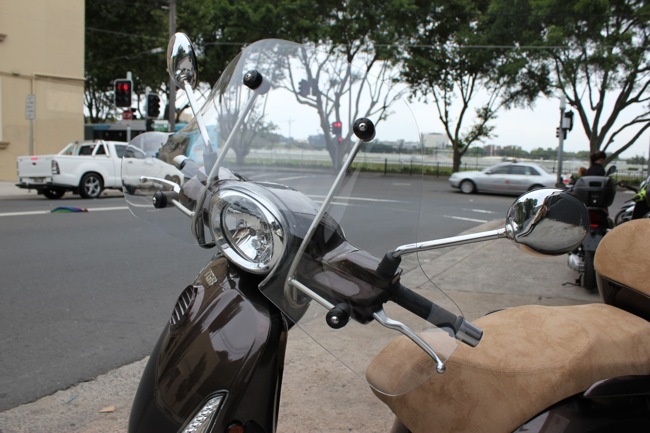 Currently four local councils, City of Sydney, Parramatta, Blacktown and Wollongong allow bikes to park free in car bays without the need to purchase a ticket from the meter. Time limits must be adhered to and this allows riders to park in the city for shopping and appointments without taking up an all-day commuter bay. Councils with busy CBDs are becoming more proactive in providing motorcycle bays, utilising otherwise wasted space and marking it up for two-wheelers. This will ease the CBD parking congestion if motorcycles don’t need to occupy a car space. 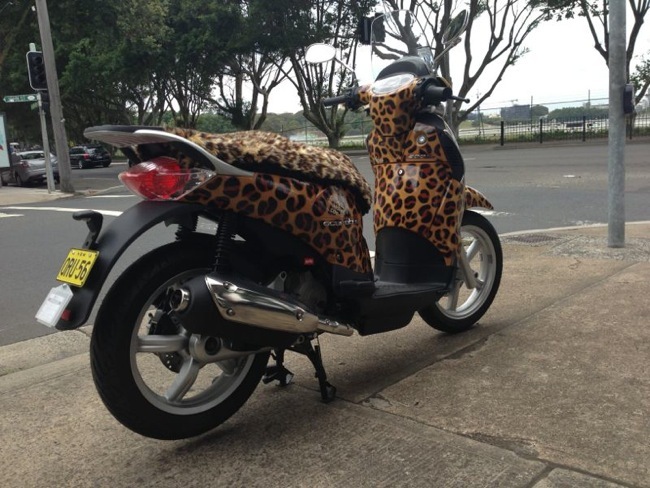 Race around town on this leopard print Scarabeo 200. Painted to raise funds in the aid of saving the lives of leopards in India. Animal Works Scarabeo 200 i.e. Aprilia Australia have donated a Scarabeo 200 in the aid of helping wildlife conservation group - Animal Works. Celebrated artist, Nafisa, created this unique piece of "Rideable Art". 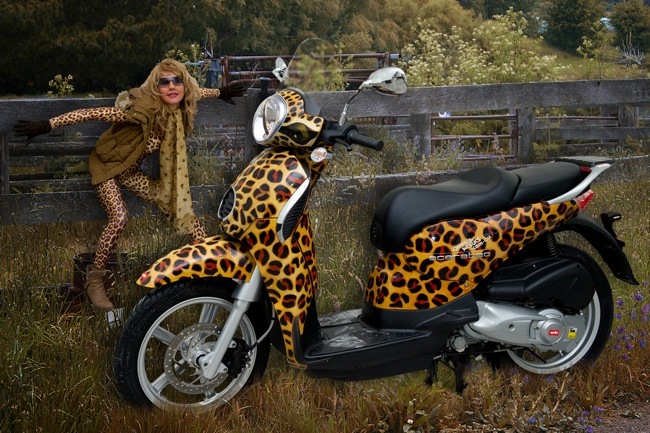 The leopard on wheels will be raffled off with all funds being used to purchase an Emergency Rescue Vehicle for the Wildlife Trust of India. A total of 1000 tickets will be sold. This will fund the hardware of a fully equipped 4WD vehicle to aid with the rescue of leopards and tigers in the Dadhwa region in Assam, where there is a growing number of incidents where these carnivores are being injured by traps, snares etc. The Scarabeo can currently be seen at Racecourse Motors Randwick. 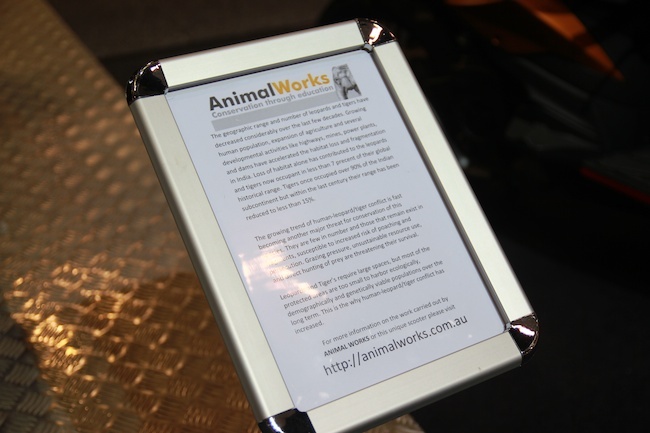 See more about Animal Works at http://animalworks.com.au. Tickets can be purchased on the website at a value of $20 each. Once all 1000 tickets are sold the winner will be drawn. All ticket sales/donations are tax deductible. Armadillo Scooterwear is back with an updated range and brand new website. The range has been tweaked and prodded to make sure the savvy scooter rider is getting exactly what they want; timeless style, finely finished quality and peace of mind when riding. Armadillo Scooterwear has seven styles in its range and all include the following features our customers have come to expect. All styles are available for free delivery via the website armadilloscooterwear.com. New colour for X Race 150. Two colours now available, traditional black and now an all-new white. TGB have released a new colour for the X Race 150. The X Race is now available in a new white colour scheme with race inspired graphics. This new colour joins the existing black/red colour scheme below. 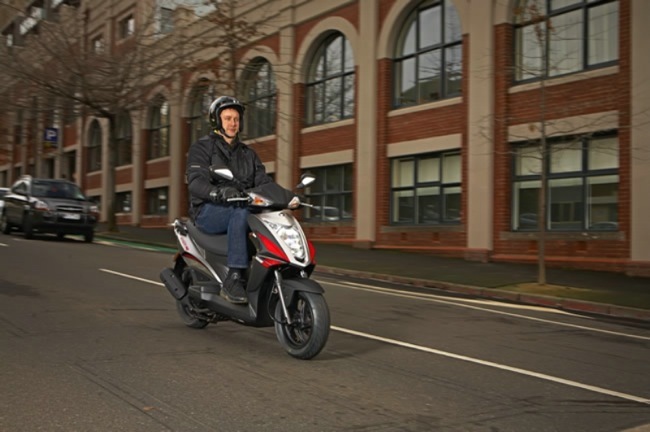 New pricing released on key Kymco Australian models. 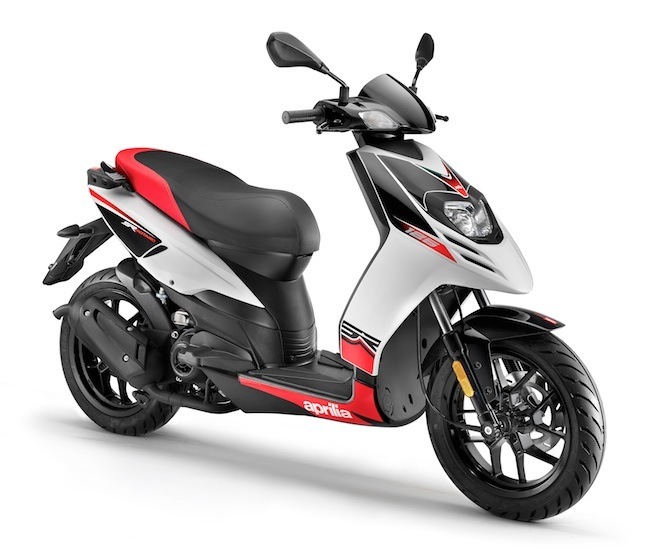 Kymco have revised the national list price on key selling scooter models. 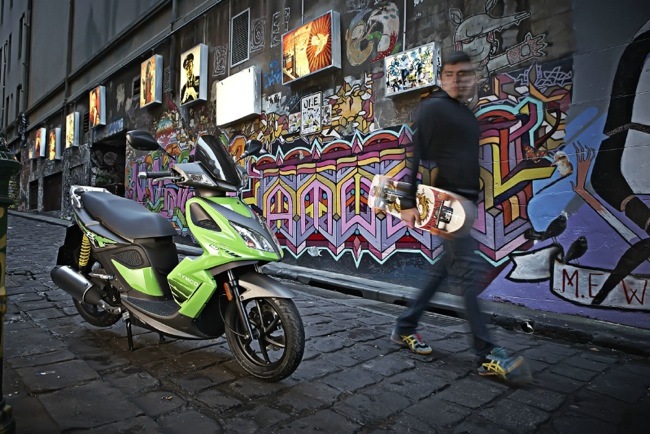 Actually, Kymco have revised the pricing across the entire Australian scooter range. Some of the reductions include Agility 50, new price is now $1690, down from $1990. The Super 8 125 now $2490, down from $2990. The Like 125 now $2790, down from $2990. 13 December 2012 - Honda Australia attended the Parliament of Victoria to hear the handing down of the Road Safety Committee's 'Inquiry into Motorcycle Safety' yesterday. Honda Australia is supportive of the majority of the 64 recommendations made by the Parliament of Victoria's Road Safety Committee. 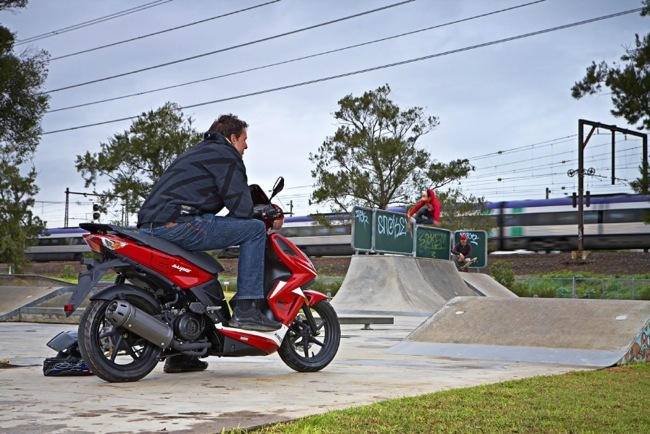 Honda Australia has long been a proactive campaigner for motorcycle safety and looks forward to these recommendations being implemented by the Victorian Government. Honda Australia has been pressing regulators and governments around Australia for accurate and transparent accident data so that evidence based safety decisions can be correctly reached. The first recommendation titled 'Data Quality And Accuracy' will assist with this goal. From Honda's perspective, it is also pleasing to see that off-road motorcycle riders have been identified and are included in the recommendations. 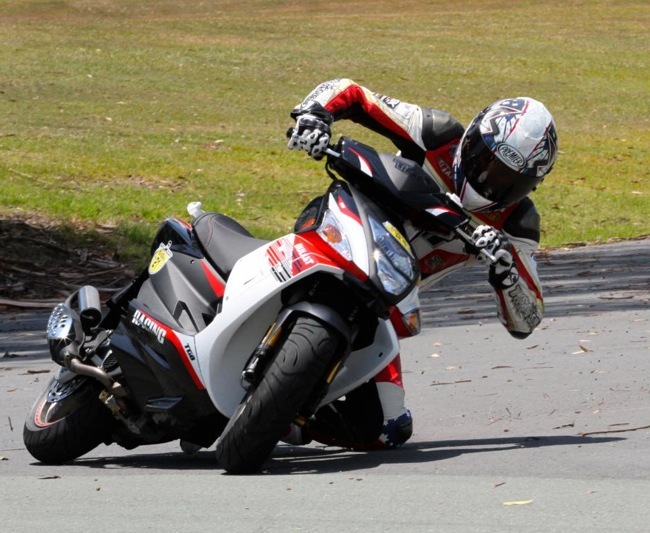 Through Honda Australia Rider Training (HART), Honda has long been working with VicRoads in relation to standards of motorcycle training. Honda looks forward to the implementation of these recommendations that will allow standardisation of training and identification of those providers who offer substandard training. Over the coming weeks Honda Australia will examine in detail the 'Inquiry into Motorcycle Safety' recommendations and provide further feedback to the Road Safety Committee. Honda Australia looks forward to assisting the Victorian Government in any way with the implementation of these recommendations. 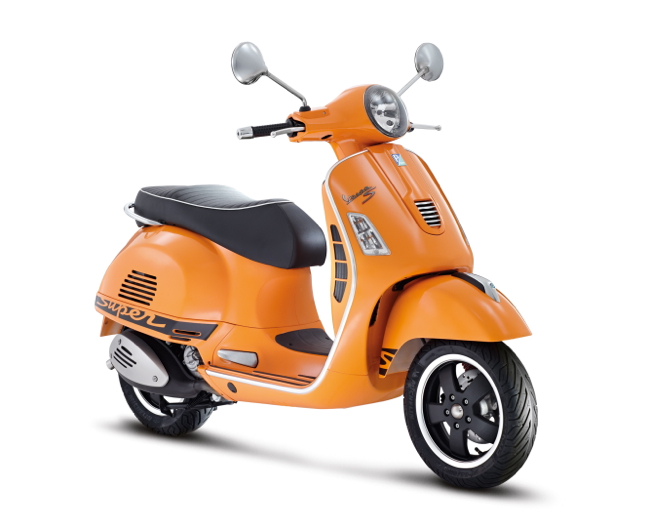 We've picked up our new long term scooter for 2013. TGB's recently released Bellavita 300. 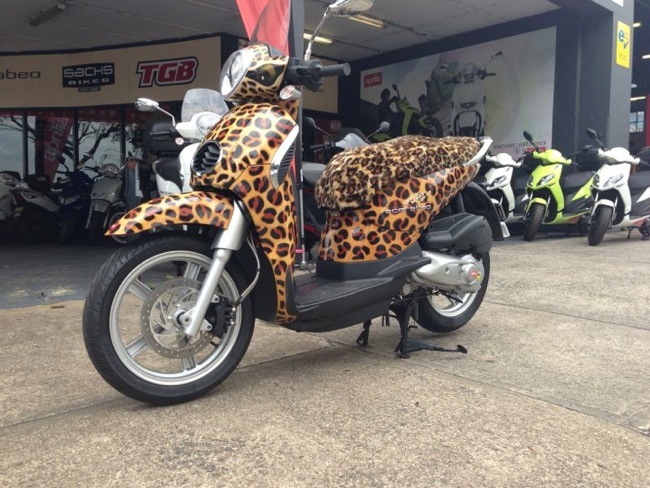 We here at Scootersales.com.au have become the proud owners of the new TGB Bellavita 300. The Bellavita has just arrived in Australia so this makes perfect timing to go through the whole ownership program. From general servicing to convenience and practicality, we'll bring you the full story. Initially the Bellavita fits the brief on paper. We were after a scooter that offered good storage, flat floor convenience and plenty of performance. It also had to fit in with a budget set by the treasury. The Bellavita looks to have this covered, good looks were just a bonus. We optioned up for the colour coded top box and small front flyscreen. For the moment the Bellavita will remain standard. The only change made so far is upping the rear suspension 3 clicks to cater for the optional box on the back. This helped front end compliance, and actually made a big difference for where the box is fitted as an option. 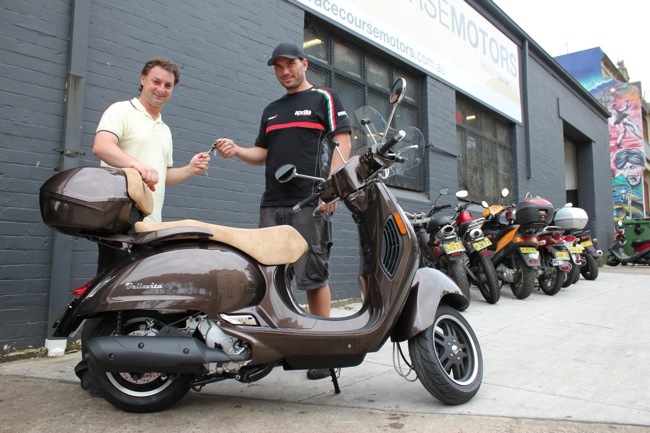 Mocha was the chosen colour, thanks goes to Allan and the team at Racecourse Motors for getting it all pre-delivered. The TGB Bellavita retails for $5490 plus on-roads. Western Australia introduces the Learner Approved Motorcycle Scheme. It had been on the agenda for a while, Western Australia would fall into line with other eastern seaboard states and offer LAMS (Learner Approved Motorcycle Scheme) to new riders. The scheme allows learner riders to select from a whole host of models with a power to weight ratio not exceeding 150 Kw per tonne and a maximum capacity not exceeding 660 cc. The scheme will go into effect on the 14th of January, 2012. In those states where LAMS already exists the market shift to LAMS approved motorcycles is immediately apparent. Even more so as manufactures release some key models in that mid capacity motorcycle class. 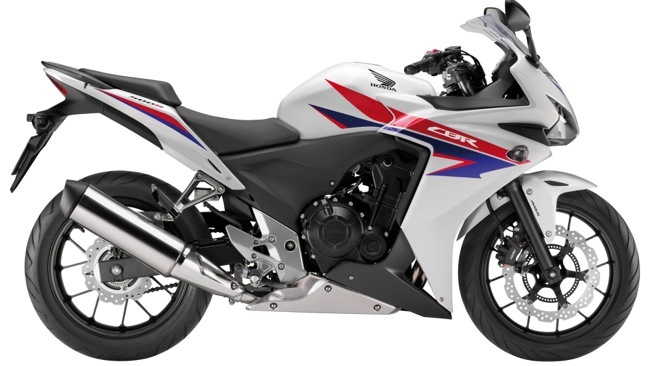 Take a look at Honda's new CBR 500 for example. For scooters, LAMS moves the 300 class into the legal zone, even allows learner riders to select maxi scooters like BMW's new C range. For further information take a look at the Western Australia LAMS fact sheet below. I've also included a download list of learner approved motorcycles and scooters for your information. Further updates on the running of the 2012 Le Minz 24 Hr event being held at Parklands Showground on the Gold Coast. Australia's most successful Speedway racer Jason Crump teams up with Australia's most successful Superbike racer Troy Bayliss in the would toughest Scooter race stating at 12 Midday Saturday (8th Dec) Gold Coast Parklands Showground's and ends at 12 Midday Sun (9th Dec). They have six world motorcycle championships between them and their support for the Le Minz 24 Hour Scooterthon will help raise much needed funds for many charities. In what can be only be described as a star studded line up, spectators will witness Crump and Bayliss go head to head with Garry McCoy himself a World Superbike and 500cc world motorcycle race winner, Stephen Gall one of Australia's most decorated off road motorcyclists, Darcy Ward 2 x world under 21 speedway champion along with 23 other teams all competing on the 50cc scooters. Don't be surprised to see a handful of other special guest riders including AFL legend and radio host Peter Spida Everritt and V8 Supercar drivers. The family event will continue to run in rain, hail or snow. Bayliss excited about the chance of rain " bring on the rain, it will really ad to the challenges of the endurance event" "I hope the Gold Coast come down and really support the event, the riders and the charities involved" Bayliss added. Spectators are more then welcome to attend, with the gold coin entry going straight to charity. Entry for spectators is via GATE 4, Gold Coast Parklands Showground's. 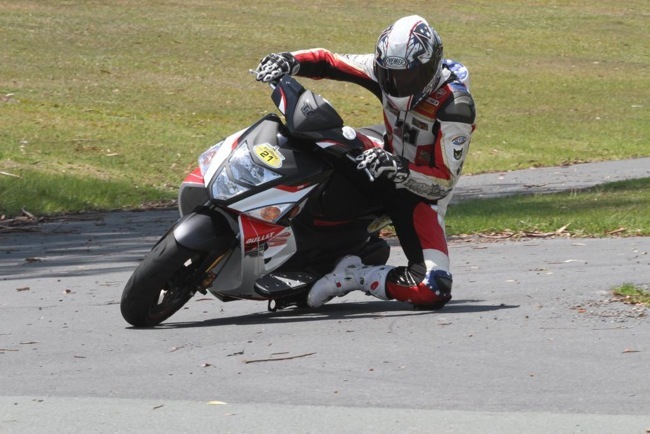 Over the coming weekend the highly exhilarating 24 hour Le Minz Scooterthon will take place on the Gold Coast. Stepping up to the plate at this year’s event to represent TGB scooters is three time World Superbike Champion Troy Bayliss who will team up with three time World Speedway champion Jason Crump and multiple Guinness Book world record holder Mark Brownie Brown. “TGB Scooters Australia is extremely excited to have the ultimate ‘Dream Team’ on our scooter at this year’s 24 hour Scooterthon,” said National Sales Manager, Alan Collins. The TGB ‘Dream Team’ will be riding the TGB Bullet RS 50 as they take on 25 other teams in the demanding scooter endurance test. The TGB Bullet RS 50 boasts 13” wheels and front and rear disc brakes, with a zippy 2‐stroke 50cc engine. 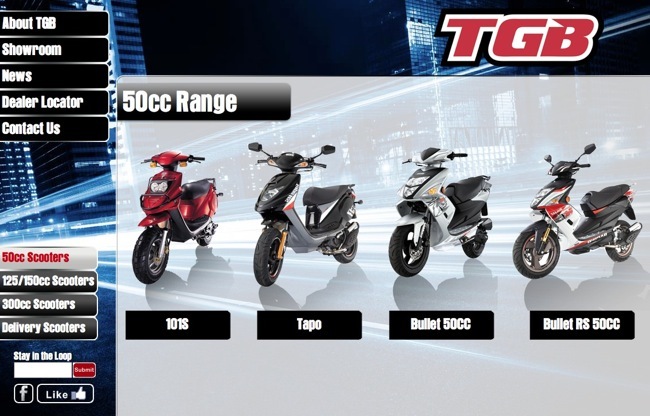 The TGB Bullet RS 50 also features modern aggressive sports styling, large helmet storage and rock solid reliability. With the combination of unmatched performance and agility, the Bullet RS is the model suited for those that settle for nothing but the best! In the 2011 24 hour Scooterthon, Mark Brownie Brown with his TGB Tapo 50 in tow rewrote the history books riding the most kilometres ever on a 50cc scooter in 24 hours. During the 24 hour endurance race the TGB Tapo scooter rode 1189.685 kilometres‐ an outstanding effort, smashing the previous record of 1178.76 kilometres. The 24 hour Scooterthon will this year be presented with by TGB Scooters and the Australian Motorcycle & Scooter Expo Gold Coast, the eighth running of the Scooterthon has a fantastic turnout and was a great success, testing the fuel efficiency and mechanical reliability of the 50cc class scooters. “The 24 hour Scooterthon is the ultimate test for 50cc scooters and will no doubt showcase to the crowds the versatility, power and superb reliability of TGB scooters,” said Alan Collins. 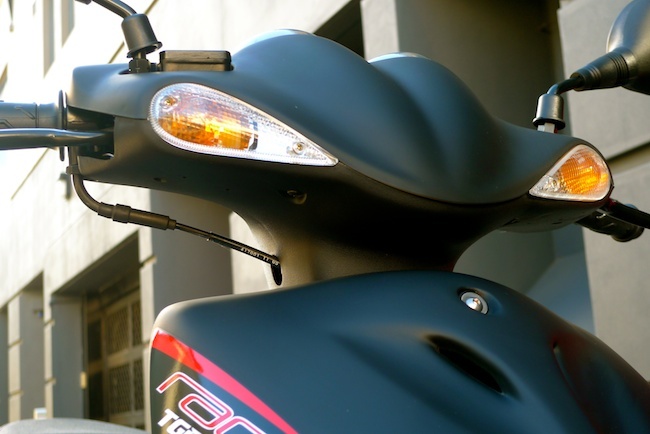 All TGB scooters are supported by a 2 Year Factory Warranty and come with world renowned reliability and power!! The Corazzo Postale can follow its origins all the way back to the year 1660. 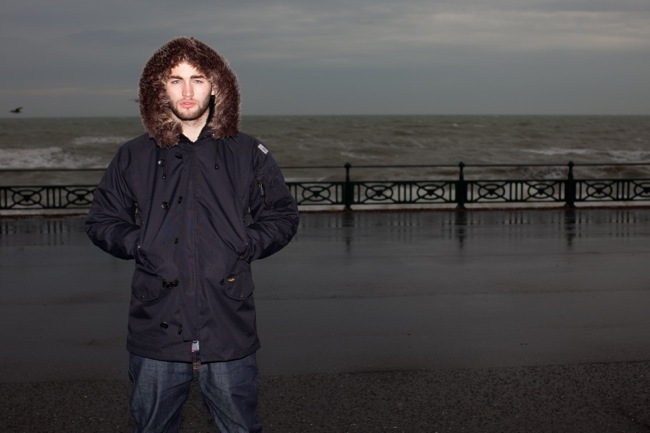 You see, the Postale, was designed to reflect those jackets worn by the UK Post. A design which offered a discreet blend of style and visibility. We may have borrowed the style, though here at Corazzo, we've taken it well into the future. Adding items like CE Rated Knox armor in the shoulders, elbows and back. Making the shoulder gussets reflective, so when you reach forward, those following can see you. Other features include a zip-out fleecy liner, YKK zippers and an abrasive and water resistant outer shell, just the thing if you do happen to take an unfortunate spill. 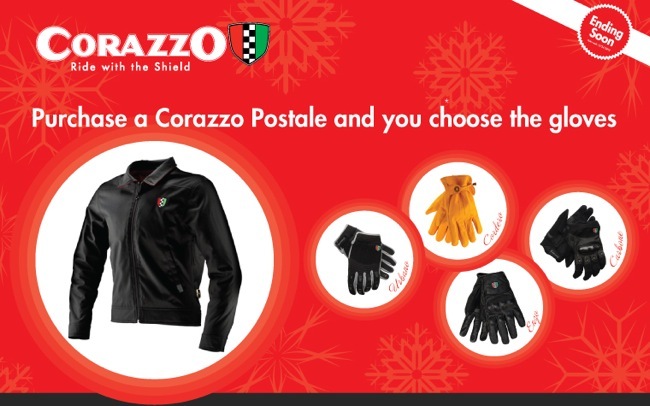 Until Christmas, purchase the Corazzo Postale and you choose the gloves, absolutely free. The Corazzo Postale is available in Black and Khaki, sizes XS - 2XL. Each year we see a limited colour run of GTS 300 SS arrive in Australia. Next years colour selections within. Two current range colours were shown at this years Eicma show. One of those was the new Nero Abisso with orange graphics, the other was the "as seen this year", Arancio Competizione (Orange). Our bet is Australia will see the matt black and orange colour scheme in 2013. Not forgetting the big news. Australia will see the 946 in 2013. 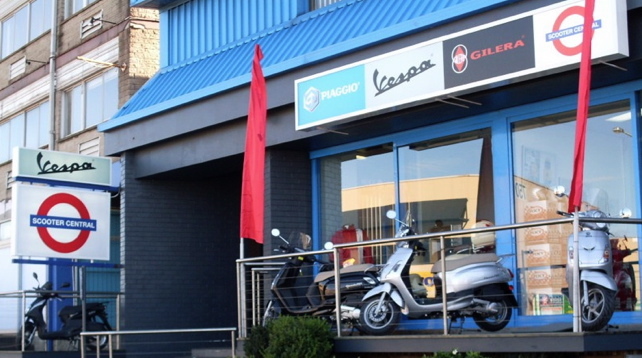 You can see Vespa Europe's press release here.